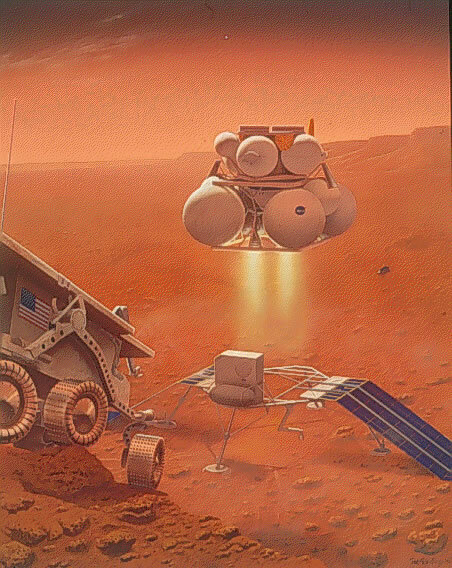 This painting shows a possible spacecraft mission for bringing Mars rocks back to Earth. The return spacecraft has just blasted off the martian surface for its return to Earth. Inside it are rock and soil samples collected by two rovers. While the rovers were collecting rocks, the spacecraft was using solar power to make its own rocket fuel from the martian atmosphere. NASA and the Jet Propulsion Laboratory are planning a sample return mission to land on Mars in 2005 and return samples to Earth in 2008. Since the discovery of possible evidence for life on Mars, they have also been studying an earlier sample return to launch in 2003, the earliest possible date, with sample return still anticipated for 2008. Instead of sending a robotic mission to Mars that would return an assortment of rock and soil samples, NASA plans to include a rock drill on the rover to retrieve a rock sample from the ancient terrain, similar to ALH 84001, in the hope of finding more information about possible life on Mars.